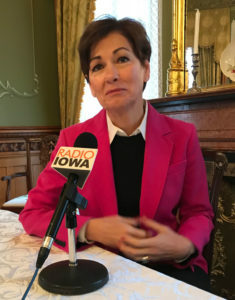 Governor Reynolds spoke with Radio Iowa today at Terrace Hill. Governor Kim Reynolds this morning said she has just started thinking about personnel changes in state government and the policy agenda she’ll ask her fellow Republican lawmakers to pass in 2019. Reynolds became governor in May of 2017 to fill out the remainder of Terry Branstad’s term — the first woman to be chief executive of Iowa government. This week, she became the first woman ever elected governor of Iowa and Reynolds said shattering that glass ceiling gives girls in Iowa a new perspective. “Sometimes you have to see it to believe you can do it and, from that perspective, I’m excited about that,” Reynolds said. It was a “bittersweet” election night, Reynolds said, as voters retired two Republican congressmen who’ve been serving in Washington since 2015, while retaining Republican control in the state capitol. As she said in her Election Night victory speech, Reynolds indicated she hopes to meet with Fred Hubbell, her Democratic challenger. The discussion is likely to center on privatized Medicaid. Hubbell often highlighted complaints from both patients and those who provide care to the 680,000 low-income, elderly and disabled Iowans in the Medicaid system. Reynolds said she’s working with her budget director to evaluate the state’s finances, aiming to carve out a reduction in the state’s corporate income tax rate — perhaps eliminating some income tax CREDITS in the process. As for staff changes, when Reynolds took over as governor last year she inherited the roster of state government administrators appointed by Terry Branstad. Reynolds made her comments during an interview this morning with Radio Iowa.